Left copper 1 grosz (Poland 1936) covered with verdigris (copper rust, basic copper carbonate). 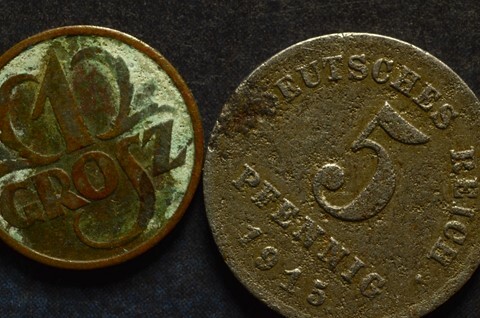 Right corroded 5 Pfennig coin (Germany, 1915) made of iron. Notes: The lens was attached to camera with 20 mm expansion ring. 50% reduction of the original.